Inexpensive, nonstick, and practically indestructible, a cast-iron skillet rocks at almost any type of cooking. My favorite pan to cook in, by far and with no close runner-up, is my 35-year-old cast-iron skillet. It was my mother’s pan, and just seeing it on the stove conjures memories of her fried chicken, her macaroni and cheese, and her pot roast. 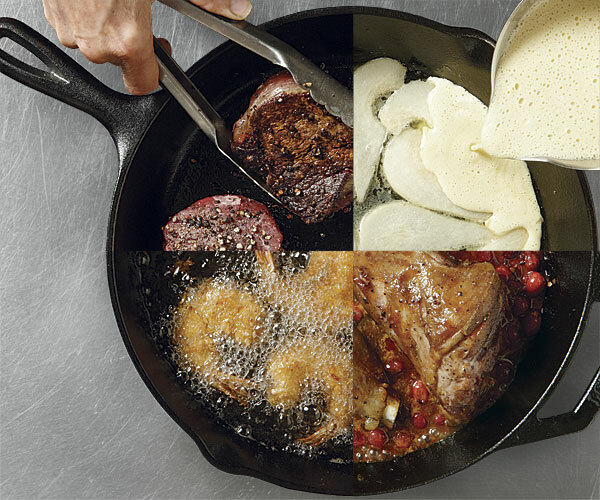 Slideshow: From appetizers to dessert: recipes for your cast-iron skillet. But it’s not just sentimentality that makes this the most-used pan in my kitchen. It’s practicality, too: There is simply no other pan that holds heat as well. Other benefits of cast iron include a low price tag, a nonstick surface, and almost total indestructibility. Doubtful about that last one? Hop online to a cast-iron forum and you’ll find collectors and fanatics talking about pans they use that date back a hundred years or more. Cast iron’s heft is what makes it perform so well. Cast iron doesn’t conduct heat well; it’s slow to heat up and cool down, and until fully heated, will have hot spots. But its weight and thickness compared with other metal pans means that once it’s heated, it retains that heat, making it the top choice for all kinds of cooking methods. 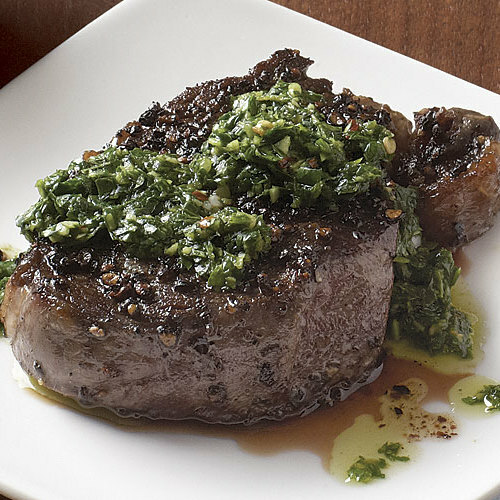 As you’ll see on the following pages, a hot cast-iron skillet sears steaks beautifully, giving them a thick, browned crust. 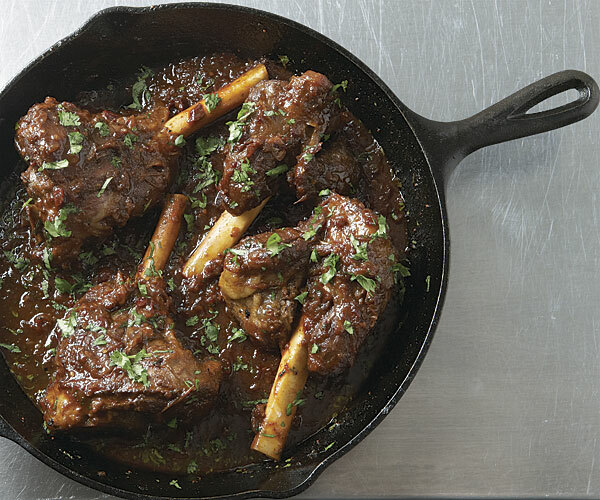 Yet it can also gently simmer lamb shanks at a constant low temperature to coax the most tender results from a braise. 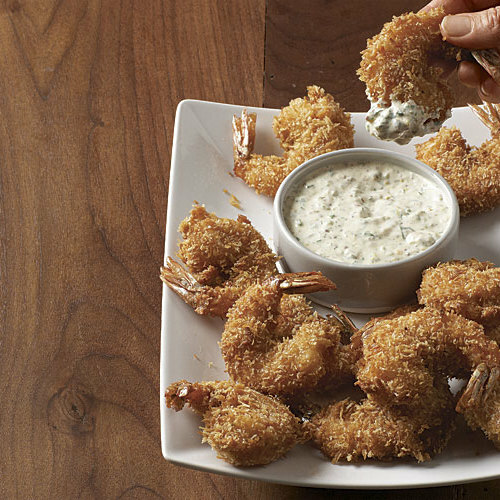 It’s also a fabulous choice for frying and baking, as demonstrated by crisp fried coconut shrimp and a puffy baked pear pancake. Seasoning creates a nonstick surface. One reason folks are so fond of their old cast-iron skillets is the patina—known as “seasoning”—that builds up in the pan with use. As oil seeps into the surface of the pan, it eliminates any microscopic roughness on the metal that can cause food to cling, creating a virtually nonstick surface. Nowadays, a new cast-iron pan will likely come preseasoned from the factory; both Lodge, the largest maker of cast-iron cookware in the United States, and Camp Chef sell them that way. Yet even a preseasoned pan will continue to improve with use. Caring for cast iron is easier than you think. It’s all about keeping that seasoning intact. There are basically three steps: washing, drying, and coating with oil. Because detergents can degrade the seasoning, I simply wash my skillet out with hot water and a sponge or a natural- or nylon-bristle brush—never a scouring pad and never, ever in the dishwasher. If food sticks, a soak in hot water usually does the trick. Drying the skillet completely is important to keep it from rusting; I like to put the clean pan in a warm oven or on a low burner for a thorough drying. Then, while the pan is still warm, I apply a very light coating of oil before storing it in a dry place (at my house, the pan stays right on the stove because it’s used so much) with the lid off, or at least askew, to avoid trapping any residual moisture. If your skillet does lose its nonstick coating (which can occur if, say, someone trying to be helpful scrubs the pan with steel wool, as my husband once did), reseasoning is a simple, mostly hands-off process. All you have to do is wipe the inside with a light coating of oil or shortening and bake the pan upside down (put a piece of heavy-duty foil on the rack below the pan to catch any excess oil) in a 400°F oven for an hour. Turn off the oven and leave the skillet in the oven until cool. 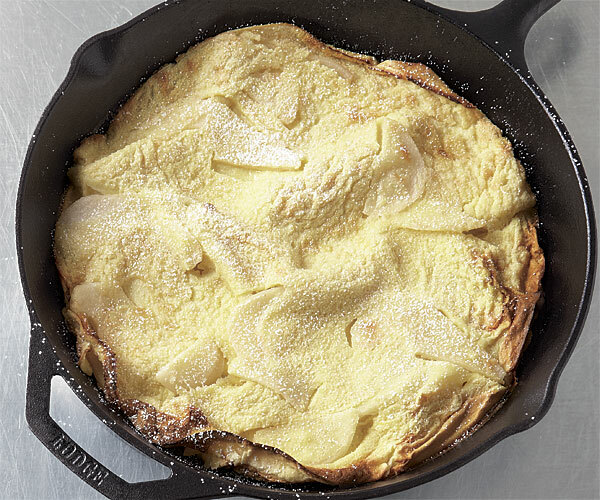 A cast-iron skillet does have one unavoidable drawback: It’s heavy. But as I lift it, often with two hands, I know it’s that weight that makes my pan so great. 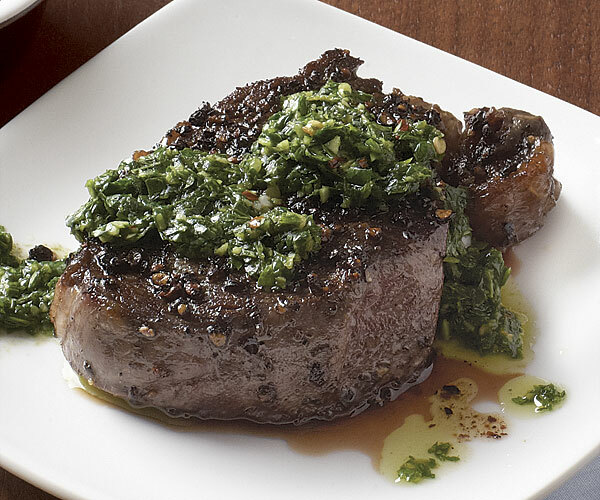 Hoisting the skillet didn’t bother my mother, and it doesn’t bother me, especially once I’m sitting down to a juicy steak that’s been seared to perfection in my favorite pan. Nonstick pans release foods well, but because they’re not supposed to be used over high heat, they can’t brown foods deeply. Regular metal pans can be used over high heat to brown well, but foods can easily stick. A cast-iron skillet, however, can be used over high heat to brown foods beautifully, and if well seasoned, it’s also nonstick. If you’re sear-roasting, as in the recipe here, cast iron is a great choice because it can be transferred directly to a hot oven. Thick, heavy cast-iron skillets distribute heat evenly to produce a well-browned, nicely textured crust on baked goods. 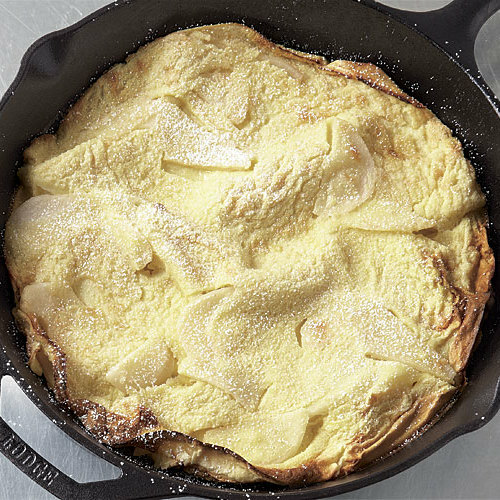 (In a comparative tasting of this pancake recipe in the Fine Cooking test kitchen, the one baked in cast iron had a crust clearly superior to the one baked in stainless steel.) A cast-iron skillet is also just the thing for cornbread, and there’s nothing more homey than serving it directly from the pan. The secret to braising—low and slow cooking in a little liquid—is to maintain a gentle, even simmer. 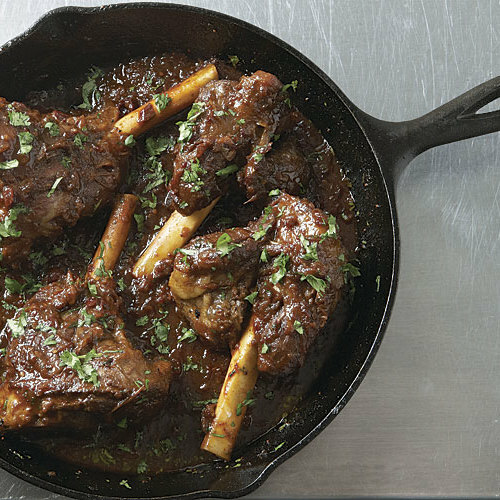 A cast-iron skillet keeps the temperature steady even when the heat is low, and its size works well for smaller cuts of meat, such as short ribs and the lamb shanks here. For crispy fried foods, cast iron can’t be beat because it holds a fairly constant temperature even when food is added to the oil in the pan. As a result, the food’s exterior is quickly sealed and the interior absorbs less oil. 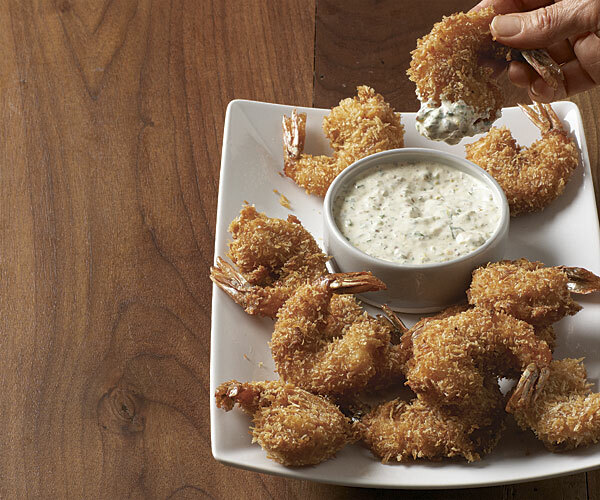 The skillet’s large surface area allows you to cook a lot of small things, like the coconut shrimp here, in one batch without overcrowding.